Chickpea Salad with Ginger has an Indian flavor, and I recently served it as a side dish to go with Vij’s Family’s Chicken Curry. I adapted the recipe from one by Mark Bittman in his The Best Recipes in the World. He did not add any oil to the salad, which certainly would make it healthy. I chose to add 1 tablespoon of light (light flavor, not fewer calories) olive oil and I omitted the tablespoon of sugar that he used. I think the oil helps to carry the flavors. Next time, I might use 2 tablespoons of oil, which is really not that much for 4 to 5 servings. 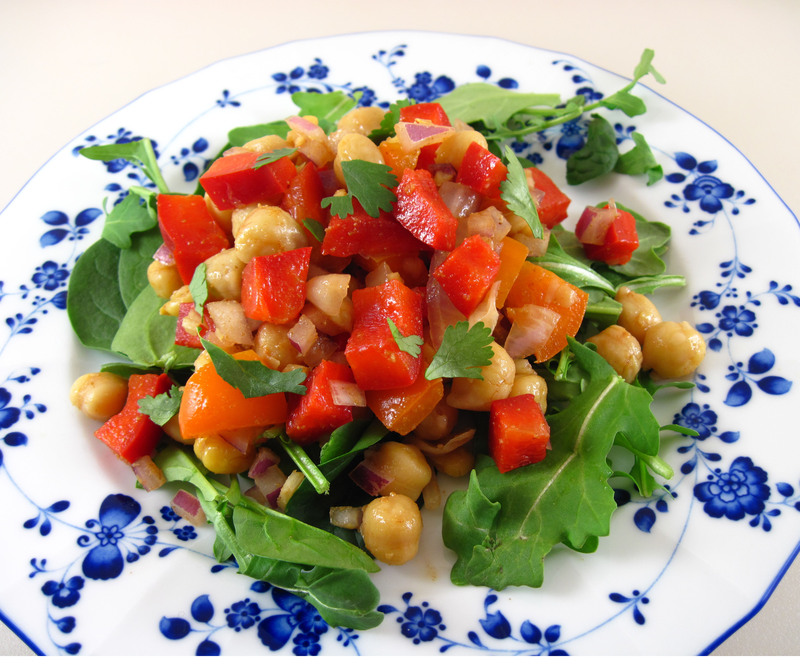 Served on a bed of arugula, I found Chickpea Salad with Ginger to be a refreshing and colorful salad to serve with a rich Indian main dish. 1. Toss the chickpeas, peppers, onion, ginger, cumin, oil, and lemon juice together in a large bowl. Season to taste with salt and pepper. 2. To serve, put a handful of arugula on each salad plate. Top with the chickpea salad and garnish with the cilantro.